QAQA Jack’s Fiji Limited presented a cheque of $2000 to the Ratu Kadavulevu School management team yesterday. The bonus payment is for the Under-18 team for winning the 2018 Powerade Super Deans Rugby title defeating Cuvu College 20-0 last Saturday. RKS also won the U14, U15, U16 and U19 grade titles. QAQA brand manager Biu Tadranu said they were delighted to help in RKS success. 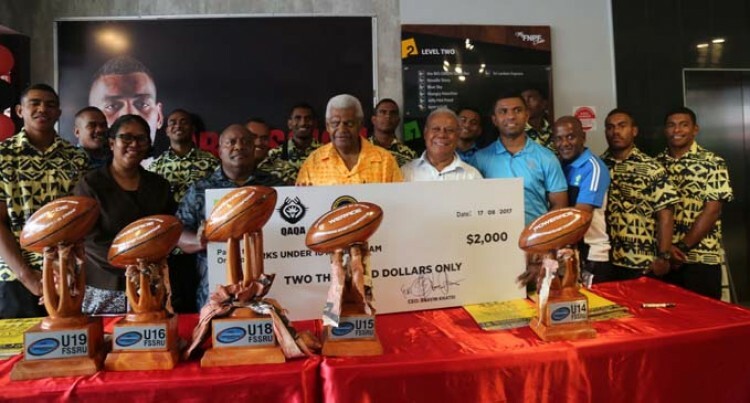 “They won the Fiji National Rugby League competition, the Sydney Sevens, Coca-Cola Games, World Sannix in Japan and finally the 2018 Deans Rugby. RKS parents, guardians and teacher’s association president Akapusi Tuifagalele acknowledged the support. “We have two more years of partnership, we do our review at the end of every sporting term.